Preparis offers leading technology and services that can simplify your company’s emergency messaging, business continuity, cybersecurity, disaster recovery, and life safety programs. 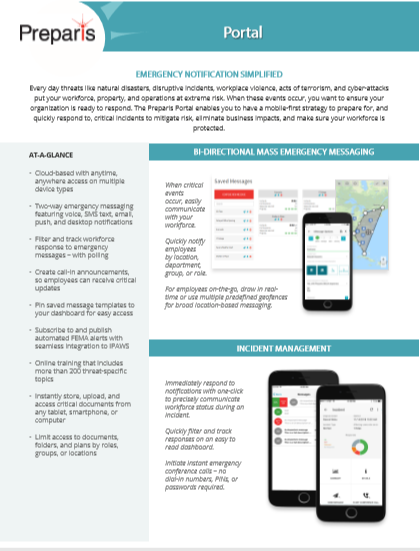 Below are fact sheets that describe our technology and services and how they can help you prepare for, mitigate the risk of, and navigate through any critical event or disruptive incident. 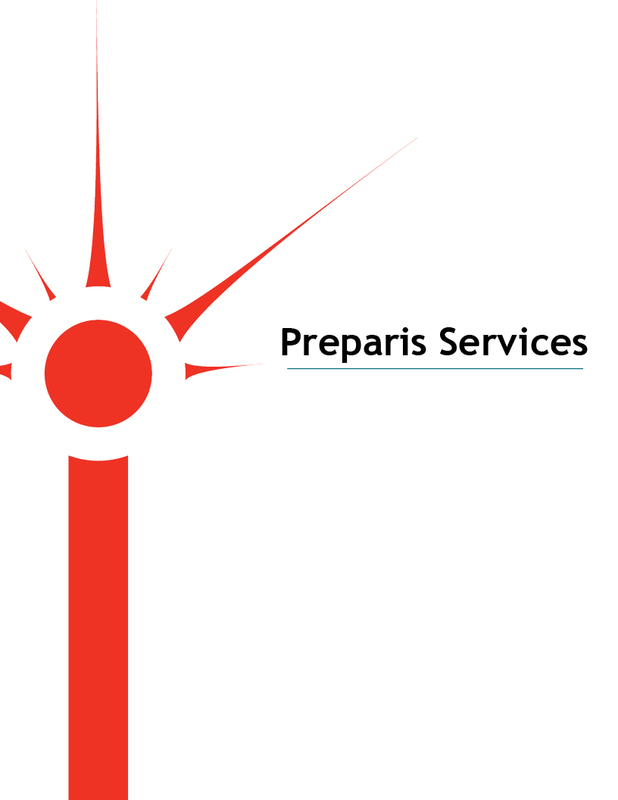 Preparis makes being ready easy so your organization is to prepared to respond to any business disruption or critical event causing crisis. The Preparis Portal enables you to have a mobile-first strategy to prepare and respond to critical incidents. Mitigate risk, eliminate business impacts, and make sure your workforce is protected. 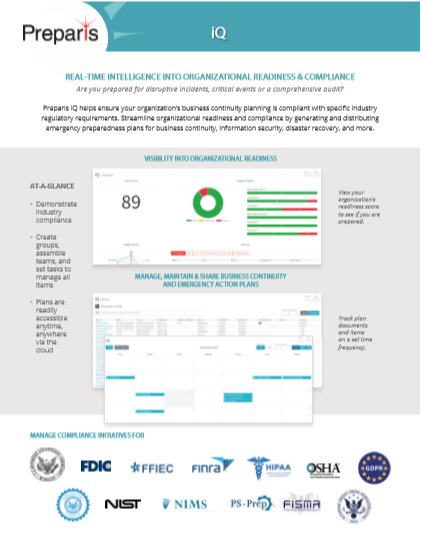 Streamline organizational readiness and compliance by generating and distributing emergency preparedness plans for business continuity, information security, disaster recovery, and more. 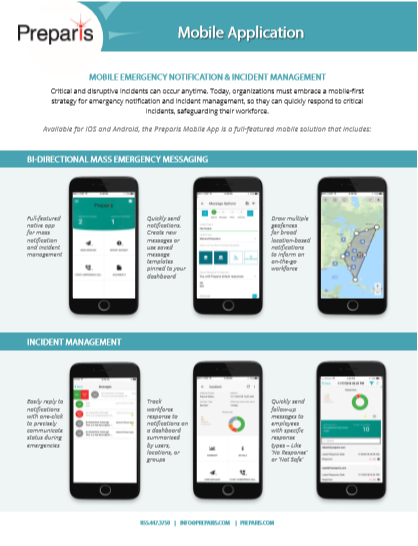 Available for iOS and Android, the Preparis Mobile App is a full-featured mobile solution for emergency notification and incident management enabling organizations to quickly respond to critical incidents, safeguarding their workforce. 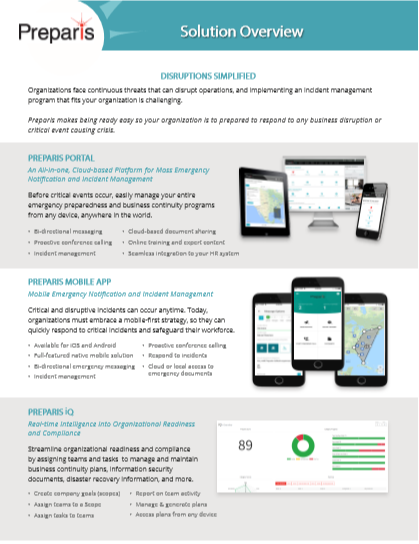 Preparis has developed a comprehensive strategy that enables organizations to effectively execute a pre-defined recovery plan in case of emergency. This has the added benefit of creating a “Culture of Preparedness” within your organization, while minimizing the impact of any disruptive crisis incident.